The first entry in Gold Robot's ongoing split series which pairs artists from different geographic regions together. 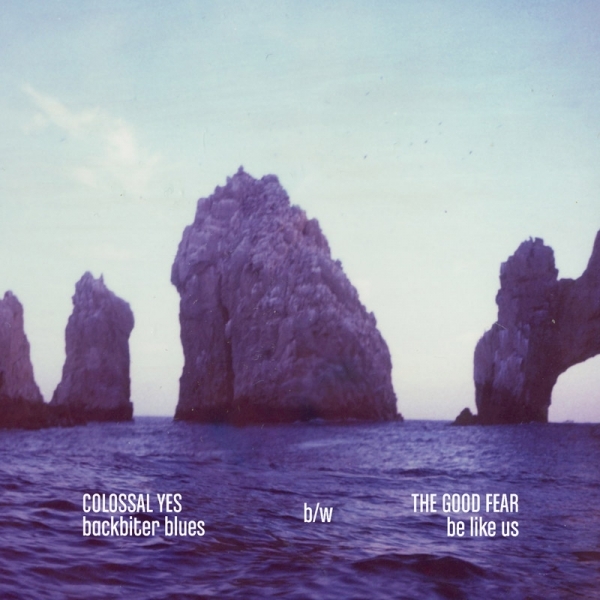 Featured here are Colossal Yes (Oakland, California) and The Good Fear (Fayetteville, Arkansas). Artwork is provided by photographers from each region (Elise Irving from California, and Rett Peek from Arkansas). 01. 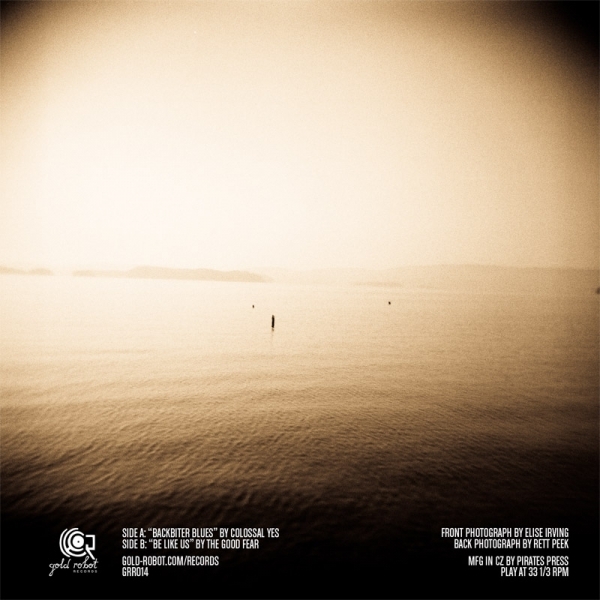 Colossal Yes - "Backbiter Blues"
02. The Good Fear - "Be Like Us"
"Backbiter Blues has a near jazz-like drum beat, pop-filled piano, and a folk vocal drawl. Emphasizing the genre blend, the band throws in a few sax and guitar solos. The Good Fear is a good match for this split. Both bands have that unrestrained folk sound and their song “Be Like Us” mixes light folk with hefty folk-rock with an epic edge, full with time signature changes, wild heights and pushy beats that keep you on the edge of your seat. The key problem becomes this: it is damn near impossible to decide which song to call your favorite. They are, in every way and form, equals in both greatness and quality." "Two sides of similar blues country rock, offering entirely different acoustic experiences...both impressive." "Colossal Yes has a pretty laid-back indie number with “Backbiter Blues.” It’s melodic, with some lovely piano and sax work that gives the whole piece a nice lounge feel. The Good Fear’s “Be Like Us” is a mirror image, using organ instead of piano, and gets a little downbeat and dirge-like, but halfway through gets all epic." "The A side is by Oakland residents Colossal Yes who ply their trade in emotive rock balladeering with muchos gusto. They play real nice music with guitar licks galore and tasteful vocals a plenty. Flip it over and you get The Good Fear (from Fayetteville, Arkansas) whose music is a little more morose and dramatic than Colossal Yes but just as consistent in quality. Kinda like Bad Seeds or Afghan Whigs maybe. 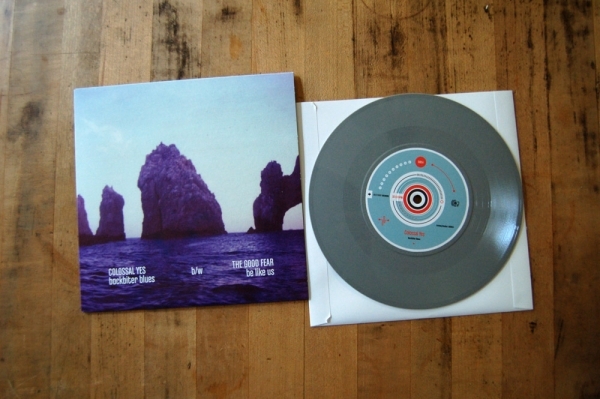 Got a bit of Queens Of The Stone Age/Mark Lanegan vibe to it too…tasty." "Kind of bluesy, kind of despairing, kind of awesome." "From the looks of the cover I half expected to hear some type of new age ambient soundscapes, but instead packed into these grooves was something much more down home and rootsy. Colossal Yes lead off with “Backbiter Blues” a track that sounds like it crawled from the recesses of a smoke-filled bar. It was no suprise to me to read this was recorded live with one mic. The vocals are gritty and filled with passionate desperation. The track throws in some loungy sax playing and a melodic piano line to fill out this dusty barroom ballad. 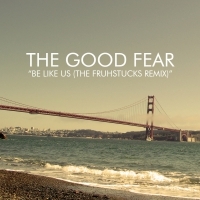 The Good Fear start their track ”Be Like Us” with a strummed acoustic guitar mixed with a droning organ, gentle backbeat and subdued vocals. That covers the first minute and a half. From there everything changes. The drums quicken the pace. The vocals become strained and filled with emotion as the song takes on shape shifting time signatures before winding down full circle to a slow, yearning ending. 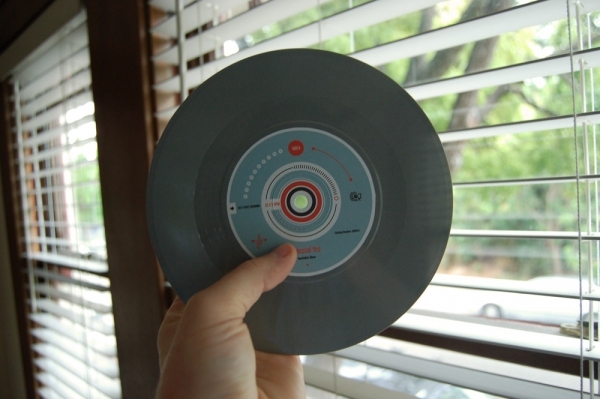 These tracks complement each other well and make for a great start to a 7” series."